Parking Lot: The city built a parking lot just north of Glendale Ave., so I'll recommend starting our tour there. There's also a Johansson bar display to look at. The picture at right shows the Johansson bar. It's the kind of lever workers on the Second Welland Canal used to lift and move the stone blocks used to build the canal. The one on display was made in Sweden and could lift 2000 lbs. 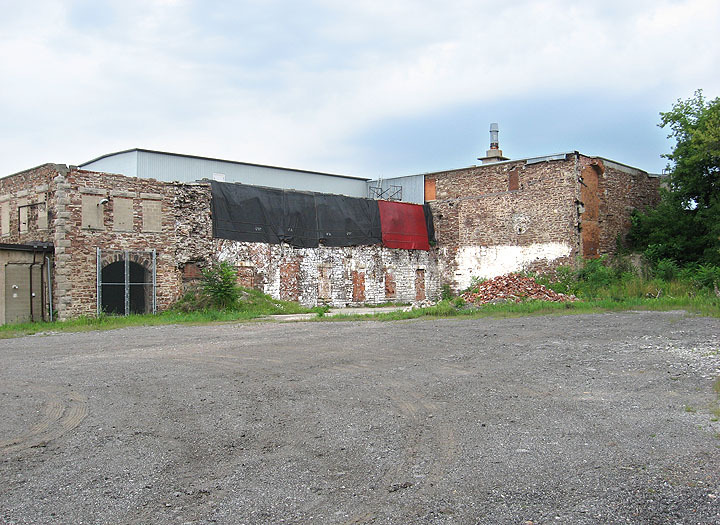 Beaver Cotton Mills: Before crossing Glendale Ave., you're going to see The Keg restaurant across the street. The building was originally built in the 1880's by Beaver Cotton Mills after fire burnt down a previous wooden structure. It was sold to the Independent Rubber Company, who made rubber boots there starting in 1912. While the canal ran to the right of the picture the canal overflow weir can be seen just to the left of the building. The building stood on a small island. Lock 15: Just north of The Keg is lock 15. It's mostly buried and better examples lie ahead so don't spend too much time here. What you might find interesting is just how close it is to Glendale Ave. There's also evidence of an older road on the north end of lock 15. As you can guess Glendale Ave. used to cross the Second Welland Canal on the north end of the lock. Bruce Trail / Ridge#1: The Bruce trail runs through the park starting at lock 15. We'll be following it for the next 500 meters. 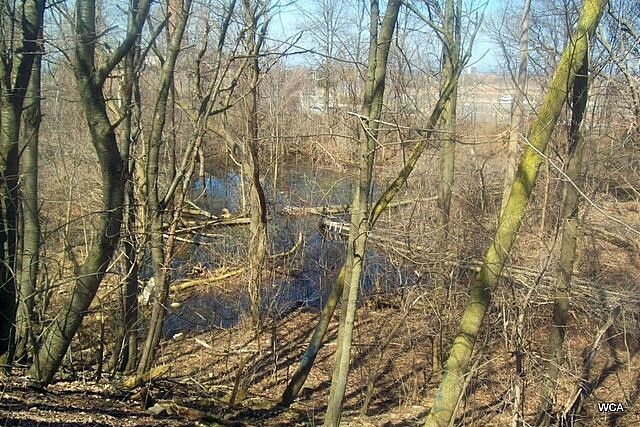 The trail leaves to the South east corner of Lock 15 along a small ridge that continues east. The ridge is actually a retaining wall for one of the ponds used by the Second Welland Canal, so far it's survived landscaping. Weir #1: After crossing behind The Keg restaurant the trail comes to a stone weir that's built into the ridge. The weir allowed overflow water from the canal to bypass lock 15 at this point and was used as a source of power by both Beaver Cotton Mills and the Independent Rubber Company. The weir is designed differently than most weirs, including both stone and concrete. It was probably rebuilt at some point. Weir Pond Basin: Behind the weir you'll find yourself in a shallow gully. Your actually standing on the bottom of one of the original ponds used by the Second Welland Canal. The gully continues to the east undisturbed for about 50 meters. Weir #2: Up the trail a little further you'll come to another ridge and a heap of fallen stones. The structure is what remains of the weir that allowed water to bypass Lock 16. You may want to wander around a bit. Through the weir you'll find the remnants of the next weir pond and a little further south, Lock 16. When you're done looking around continue following the trail. The Bruce Trail climbs directly up the weir structure at this point, if it doesn't look safe there's a dirt path you can use beside the weir. Ridge#2: The Bruce Trail continues east along the ridge. 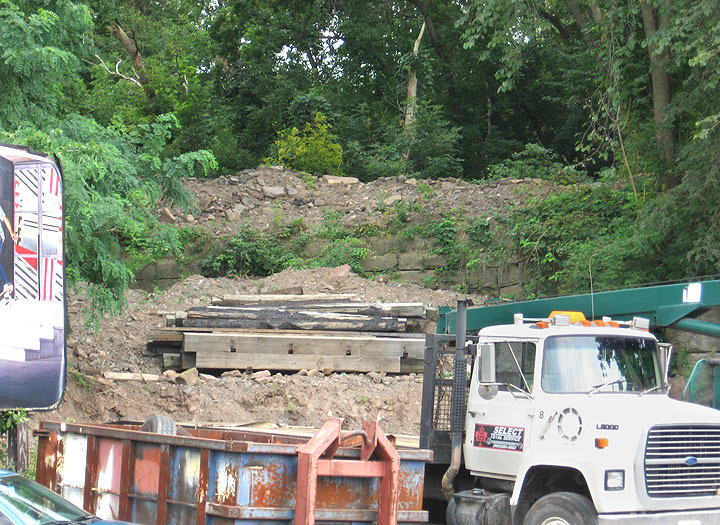 As you may guess the ridge is another retaining wall, this one once separated two weir ponds from each other. The ridge is well traveled and continues for about 100 meters. At the end the trail descends into the next gully (weir pond) and turns right. 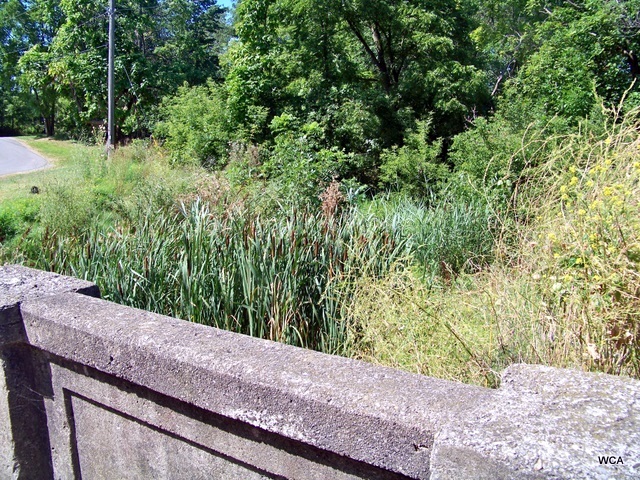 Lock 17: Lock 17 is one of the main landmarks in the park. You can walk right into the west end of the lock and inspect the lock walls close up. At the far end, stairs allow you to climb out of the lock chamber. At the top you can see the east end of lock 17. 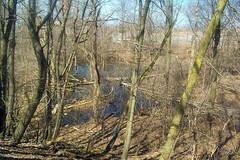 Water still flows into the far end of the lock where it goes into an underground culvert coming out at lock 13 north of Glendale Ave.
Riordin Paper Mill: From Lock 17 the Bruce Trail continues east along a larger trail that crosses the park from Bradley to Merritt St. If you follow this trail for a short distance it will split from the Bruce Trail and take you behind the old Riordin Paper Mill, built in 1867. The mill was once Canada's largest paper mill and relied on the canal for both transportation and water power. Today the structure is integrated with other buildings but can still be recognized by it's unique stonework design. Lock 24: Return to the Bruce trail and continue east. The Bruce Trail will turn right along the way but continue heading straight. A field will soon open up on the left (north) side that contains the greatest landmark in the park. Lock 24 from the First Welland Canal. 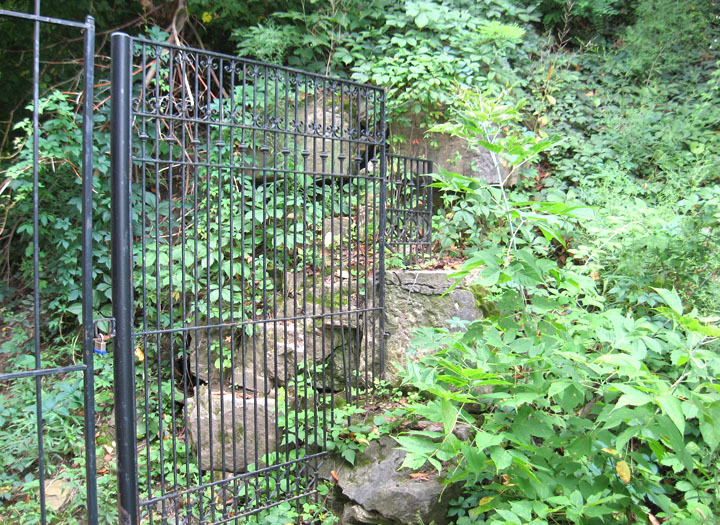 The Lock was excavated in an archeological dig in 1987 and then reburied to help preserve it. The current display marks the location of the lock. Lock 24 Plaque: Make sure you read the plaque at the west end of the lock. It's pretty lengthy and gives a lot of information about the First Welland Canal and how lock 24 was constructed. There's a small driveway just north of the park. Take it down to Merritt St. and turn right. There are 3 remnants that can be seen from the street. 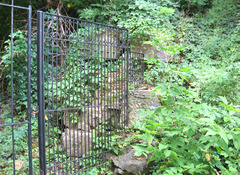 Hydraulic Weir: At the bottom of the driveway you should come to a building with a black gate fastened to another weir. This weir was called the Hydraulic weir because it allowed water to exit the canal for use by mills and factories in Merritton. This remnant has often been overlooked and confused with the next weir on our tour 100 meters further east up Merritt street. Weir #3: The next remnant along Merritt street is another stone weir. This weir allowed water to bypass lock 18. It might be easy to overlook the weir because it was buried under several tons of dirt a few years ago. Still the weir is worth a look. It's one of the last weirs left from the Second Welland Canal and unless it was damaged should still be in pretty good condition. Goose Island: The area along Ball St. was once called Goose Island and was surrounded by waterways from the Second Welland Canal. Today several homes form a small village on the "Island". At the end of Ball St. you'll come to Lock 20 of the Second Welland Canal. The city has provided a bridge across the lock that allows an excellent view down into the lock chamber. Neptune's Staircase: Lock 20, is one of 6 locks (16-21) built in a straight line along the southern side of the park. The name "Neptune's Staircase" was not original to the Welland Canal but was first used to describe the locks by Lord Elgin on a visit to the canal in 1850. Although the view is now obscured by trees the six locks resembled a giant staircase of water that brought boats up and down the escarpment. Today water still runs through the locks up to Lock 17 where it goes underground. Merritt Trail: Once you've crossed over the bridge you'll find yourself on a gravel path. The path is part of the Merritt trail a special trail that follows the entire route of the Second Welland Canal. If you want to see lock 21 you can follow the trail a short distance east, further up the escarpment. Turning right (west) will take you down the escarpment between Bradley St. and "Neptune's Staircase" and back toward the end of the park where we started. 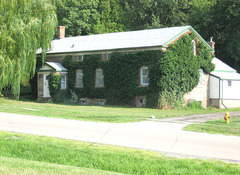 Lock tender's Houses: Continuing along Merritt St. be on the lookout for 1 of 2 lock tender's houses. 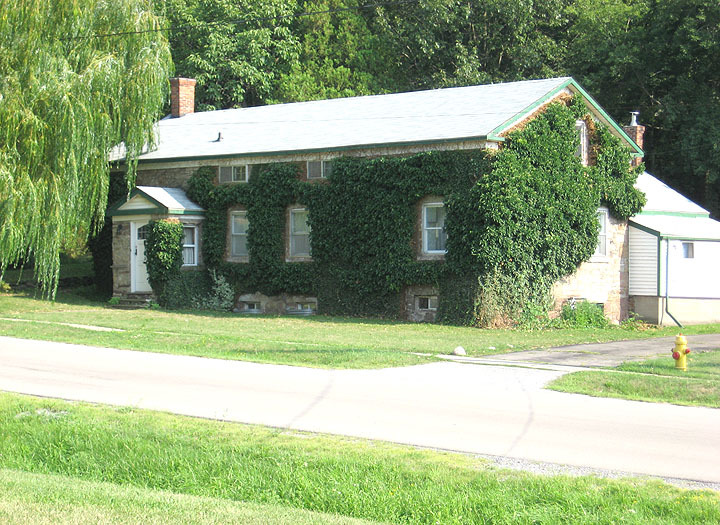 The Houses were built for lock tenders to live beside the canal. Today only two survive and both are at Mountain Locks Park. Each house is over 160 years old. Look for them as you continue along the Merritt trail at 135 and 77-79 Bradley Street. At this point your done your tour and you're only a short distance from where you started. Keep in mind you've just seen a significant part of Canadian History.